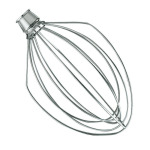 The 6-wire whip quickly incorporates air into ingredients for fluffy whipped cream, perfect boiled frostings and cakes with whipped egg whites. Fits models K4, K5, KP50, KSM5, KSM50, KSM500PS and KSM450. Warranty not valid when used in commercial environment such as a bar or restaurant.